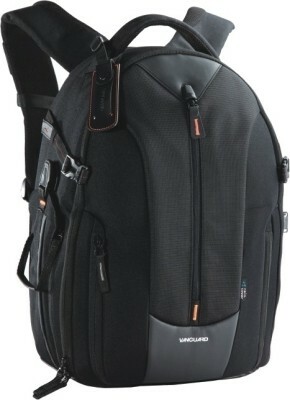 The black Up-Rise II 46 Photo Backpack from Vanguard holds a DSLR with a grip, an attached 70-200 f/2.8 lens, four additional lenses, and a flash between padded, touch-fastened dividers inside the main compartment. It also accommodates a 14″ laptop within a dedicated zippered back pocket. The backpack features a quick-access side panel to easily retrieve your DSLR, as well as a zippered front flap that opens all the way down for full access to your gear. For additional storage, there is a 2.4″ zippered interior expansion and a tripod attachment at the side. For comfort when wearing the backpack’s shoulder harness, there is a breathable, padded back panel, a sternum strap, and a waist belt. You can also carry the backpack using the padded grip handle at the top.